"The great thing about the Vicair Active is that it is a lightweight cushion"
During a mountain bike training ride I had an accident that caused a complete Spinal Cord Injury at the 4th thoracic vertebra (T4). I was doing some high speed mountain biking when I suddenly had to avoid some protruding tree roots. The manoeuvre made it impossible to stay on the track that leaded to a small bridge. I tried to jump the creek with my bike, but did not succeed and crashed my head against the shore on the other side of the creek. I had been lying in the water for 20 minutes when a dog found me. It stayed with me and made sure its owner found me. Emergency services arrived after 50 minutes. At the hospital I immediately went into surgery, after which I was informed about the complete Spinal Cord Injury. They suspect that crashing my head shattered my T4 vertebra and this damaged my nerves. After 4 weeks of recovery in the hospital I started my rehabilitation therapy at the Heliomare Rehabilitation Centre. This was a period of more than a year. During rehabilitation I was taught how to use a wheelchair. At first I made passive transfers, later on I started making active transfers. The front of my wheelchair cushion needs to be stable enough for me to be able to transfer in and out of my wheelchair. The back of the cushion has to protect the skin on my buttocks and ideally this part also offers me stability. I am a sportsman and hate sitting around doing nothing, so the cushion should conform itself to all of my activities. The Vicair Active is able to do so and provides all of the above. The front of the Vicair Active offers sufficient stability. The rear compartments are filled with air cells that offer me skin protection and improve my freedom of movement. The Vicair team helped me to further optimize the filling grade of the cushion to the shape and needs of my body. Because of my active lifestyle I often transfer in and out of my car. 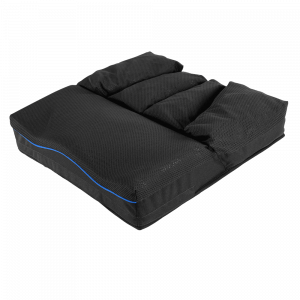 The great thing about the Vicair Active is that it is a lightweight cushion. I can leave it in my chair and still easily lift my wheelchair into the car. As I said before: I am not the type of person to do nothing. I’m very active and currently I am completely into golf. You can find me at a golf course 4 or 5 times a week. I love to ‘stand’ in my ParaGolfer and push my physical and mental limits. My biggest dream? To win a gold medal at the Paralympics! Unfortunately golf is currently not a Paralympic discipline. 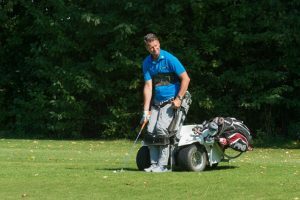 I hope they will be able to develop a good classification system and that golf can be added to the 2020 Paralympics in Tokyo. The four rear SmartCell compartments provide a high level of comfort and skin protection. The foam front makes transfers easy and feels steady and improves wheelchair handling. The foam inlay is protected by an easy-to-clean fluid resistant liner. The rest of the cushion is 100% machine washable and breathable. An easy accessible storage pouch for precious belongings (keys, phone, wallet).